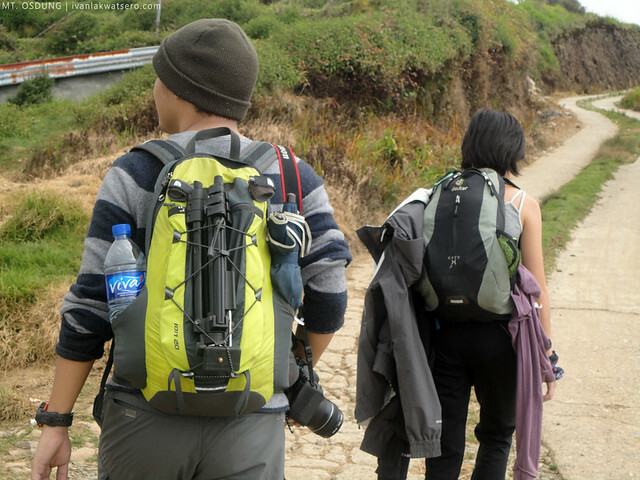 We headed straight to Dangwa Bus Terminal upon our arrival in Baguio at around 4 in the morning, I was with the Tramping Philippines team and my hiker friend Allan. Since it's quite too early from what we were expecting (5:30 AM pa nagsisimulang magbenta ng tiket sa Dangwa Terminal), we headed first to the restaurant adjacent to the ticketing office. Breakfast muna. 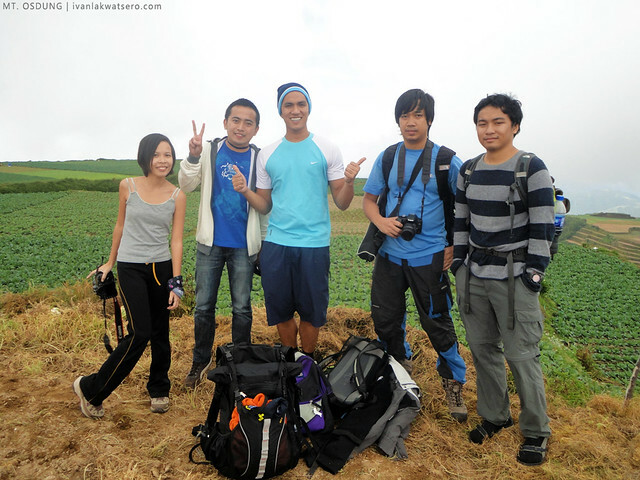 Shortly before we buy tickets, my blogger friend Joven of www.travextravels.com arrived to complete our dayhike group. We're all set and ready for a climb at Mt. Osdung. 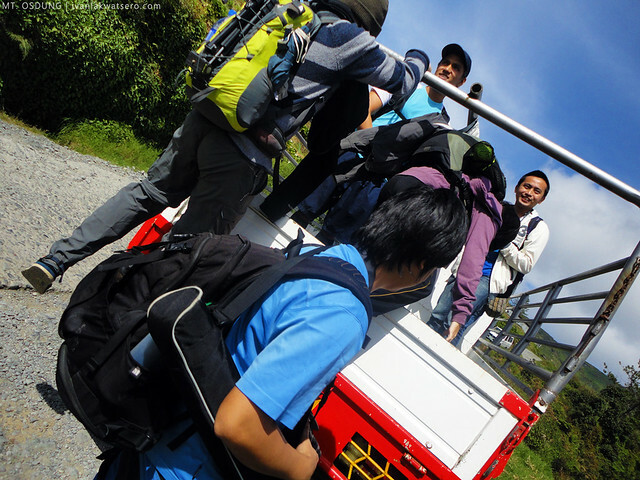 We took the first bus (06:00 AM) bound for Sagada as it will pass by Collideng Junction, the jump-off for this day's mountain. 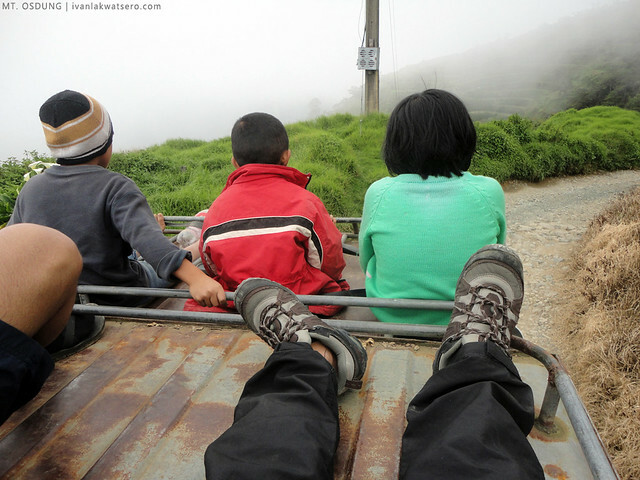 My eyes were wide open during the entire trip that lasted for about 3 hours (fare was just P95) along the Halsema Highway. I simply cannot afford to miss the beautiful views outside my window. Salit salit lang ang mga bundok at terraces, We even passed by the Highest Point on Philippine Highways, as well as the jump-off for Mt. Timbac. It was almost 9:30 AM when we reached Collideng Junction. The weather was perfect, a very good sign for a very good day hike. From the junction, we just followed the concrete road leading up to the summit that we can see from below. But in no more than 5 minutes of walking, we hitched on a vegetable truck up to the village center, cutting our walking time by 30 minutes or so. Maraming truck ang dumadaan sa road, pwedeng pwede maki-hitch. The people were so kind that they even invited us to celebrate with them in a wedding occasion, maki-kain na din daw kami. We said we will join them after we reached the summit of Mt. Osdung. So we walked further up the road, asked the locals we met along the way about this Mt. Osdung. 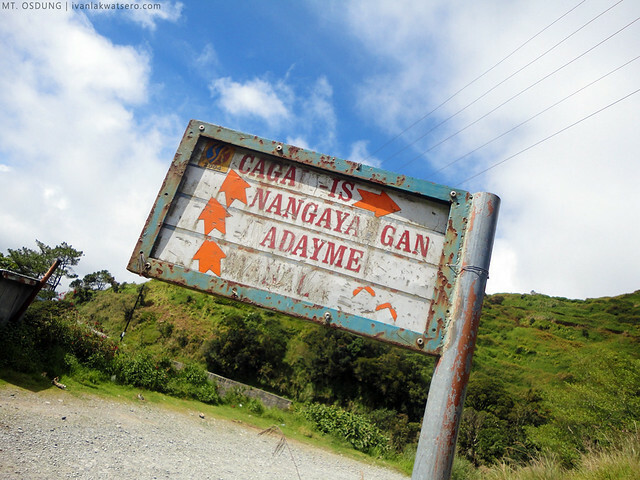 At first they seemed clueless about the mountain, but when Joven talked to them in Ilocano (buti na lang may kasama kaming marunong mag-Ilocano), they pointed us to Sitio Cagam-is (about 30 more minutes away). We saw three peaks, the middle has a cell site, so we thought it is the summit of Mt. Osdung. 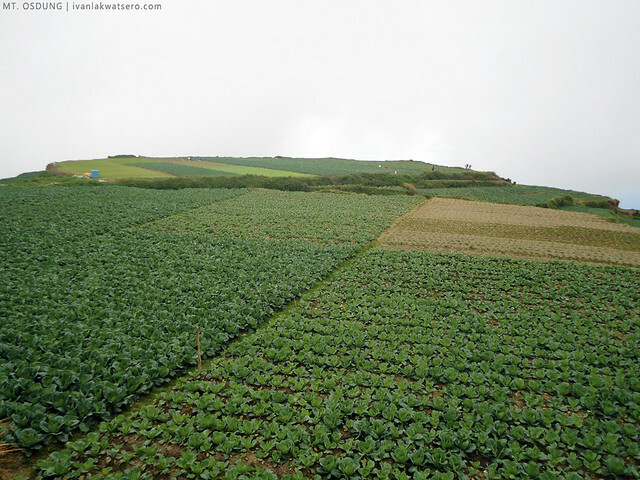 The road passes by numerous vegetable farms. 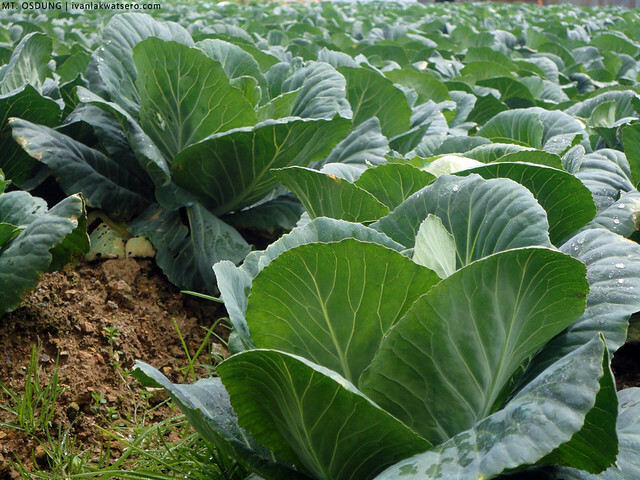 There were cabbages, pechay, potatoes and carrots. 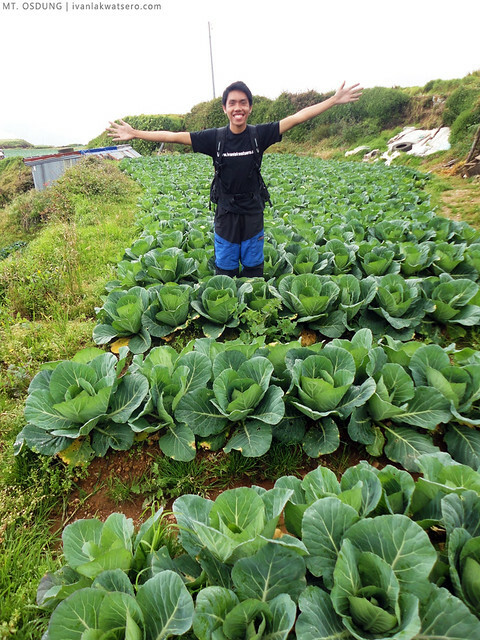 Feel na feel mo ang pagiging "Salad Bowl of the Philippines" ng Benguet. 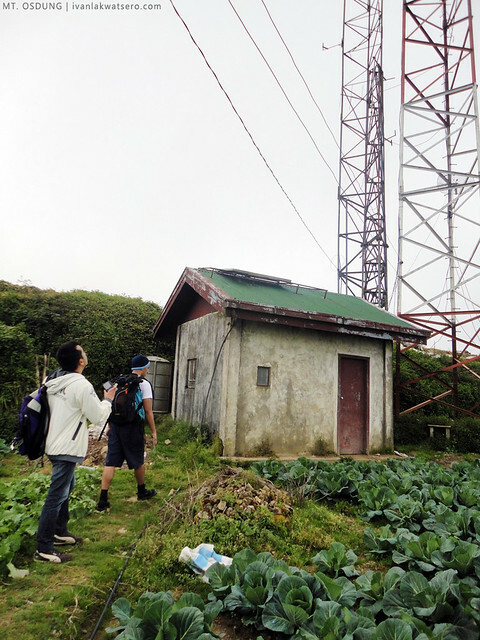 As we near the summit with the cell site, we noticed that a group of locals (Igorots) were busy preparing something along the road to the summit. When we looked closer, we saw that they just slaughtered a pig. A bearded woman then quickly approached and shooed us, telling us that they were performing some kind of a ritual. When we asked her where we could see the summit of Mt. Osdung, she directed us to a different peak about 10 minutes from the summit we believe was Mt. Osdung. We were on our way to the peak she was pointing at when we realized that it truly looked like not the summit of Mt. Osdung. Good thing, we saw a path leading to the summit we were looking for, so we followed it instead of going to the peak that the bearded woman was referring. 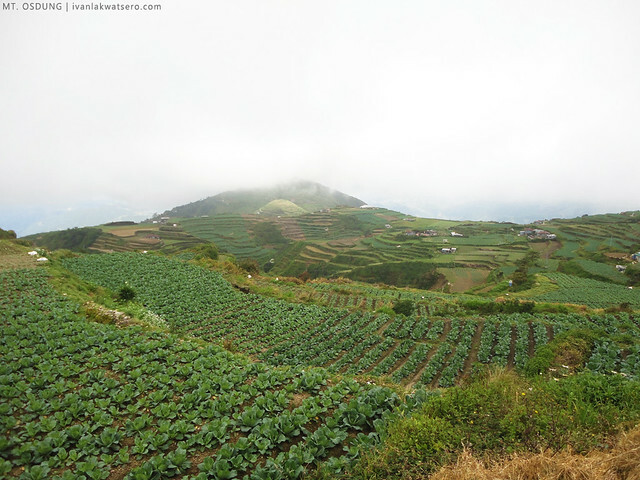 vegetable terraces dominate the landscape in the area. We were right after all, the familiar scene posted on doc Gideon's article was right in front of us. But beside it is again the group of local women we encountered earlier who were performing a ritual. To our surprise, they were cleaning the coffin of their long gone Apo (chieftain). Kita namin kung pano inilipat ng bagong kabaong yung bangkay. Quite creepy but that's their ritual, their culture. Young local women who were just nearby talked to us and said that we should not get any closer to the ritual or take pictures of it. summit of Mt. 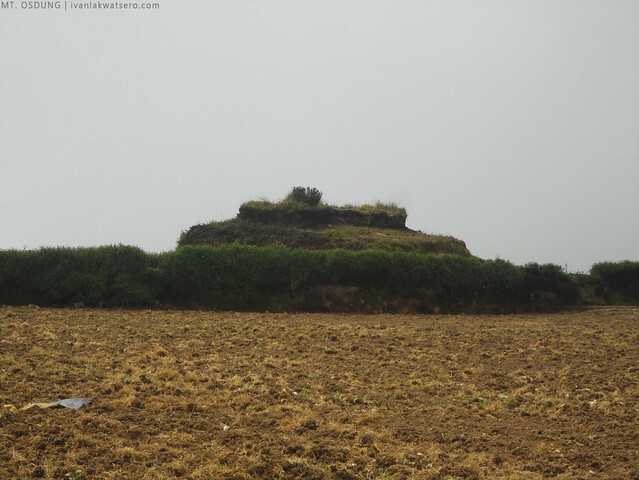 Osdung , we wanted to get closer up to that rock but the on-going ritual forbade us from doing so. Minutes after we reached the summit area, the bearded woman once again approached us (now I wish I had a picture of her), this time she's a bit irritated with our presence. She again shooed us while telling us that we're so "makukulit". She even asked if we have permit for going into that mountain. We just apologized, did not explain further, and swiftly evacuated the mountain. On our way down, we saw an empty jeep. We asked again if we could hitch, and the driver allowed us naman. yipee. We passed by the wedding occasion but the ceremony wasn't over yet. 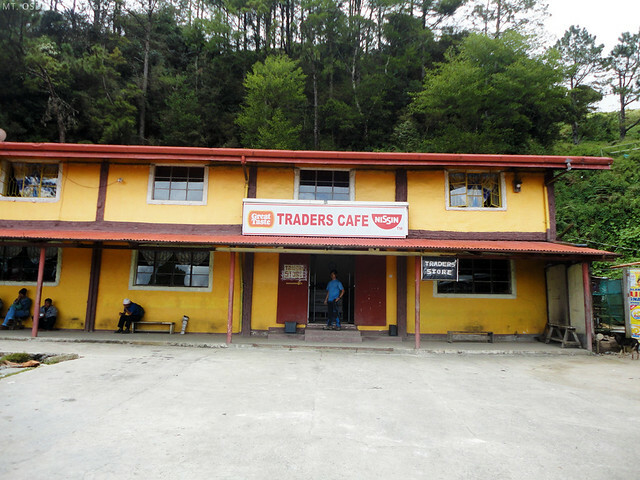 So we just went back to the junction, had a quick meal at Traders Cafe and hopped into the bus going back to Baguio City. 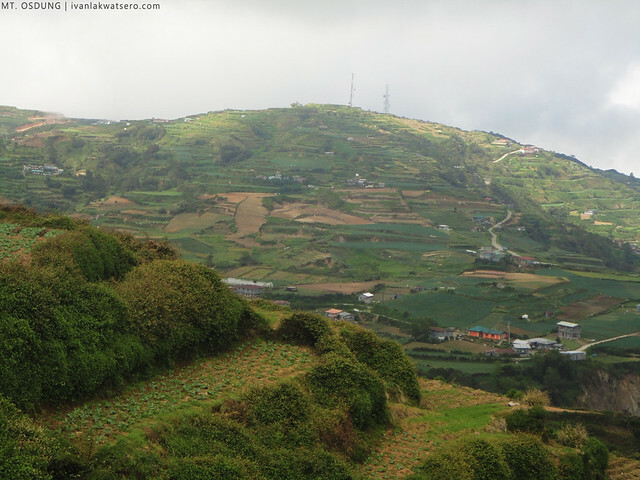 Ito pa ba ung trip mo with Azalea or another day back to Baguio?